Brodie Blog: We made it to Bluff!!!! We have walked over 3,000 kilometers to get here, what an amazing journey and an awesome adventure. New Zealand is such a stunning country and we feel privileged to have been able to walk its length on the Te Araroa Trail. We walked from Colac Bay to Riverton, a beautiful harbour village full of character and charm, then on to Oreti beach, the famous beach where Burt Munro tested his fastest indian !! The forecast was for a rainy day but we had the most beautiful day out of nowhere. We had fantastic views of Stewart Island and Bluff in the distance. The beach was full of amazing pebbles and strange seaweed (Steve was tempted to try it as he is getting over the dehydrated vegetarian pasta dish. We felt as if we had come full circle (metaphorically, as it was really a straight line !!) back to a long sweeping beach just like Ninety Mile Beach and it felt very special to be there. The tides were just right for us and our last river crossing of the trip was just a splodge. Last river crossing. Stewart Island in the distance. Finally we reached the access road and civilisation - cars on the beach, dog walkers and surfers. Steve celebrated with a quick dip in the Southern Ocean with the emphasis on quick. We the headed inland towards Invercargill. We had a great day in the city and met the Mayor, Tim Shadbolt, as we were probably the slowest couple to have walked the Te Araroa and he had met the fastest guy. The weather was not kind that day but it did not seem to matter. So off on the final sections down by the estuary to the long road walk to Ocean Beach. There are plans to create a walkway all the way to Bluff but the project needs funding. There was a great boardwalk section and a wonderful bench that Steve made full use of. We saved the last 7.2 Kms for our last day so that we would not look totally exhausted for the photos at the end , but more importantly so that Beth could join us and Dave and Kirsty could be there with us. 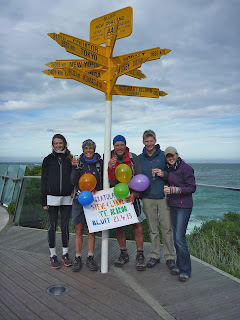 It was overwhelming to be met by the gang at the signpost and so special, thanks guys!! Our journey along the Te Araraoa has been a celebration for us of two wonderful people, my Mum Elsie and my brother Brian and they have been with us in our hearts. We have raised over $6,000 for Cancer Research thanks to the generosity of all you guys out there that have read the blog and kept us going. We have been overwhelmed by the generosity and hospitality of all the people that have helped us along the way. 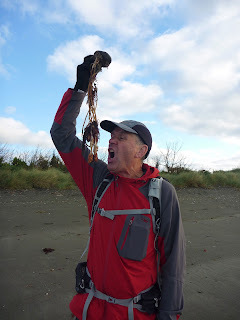 The Te Araroa has also been a personal challenge to us both as well and I am amazed at what it is possible to achieve when you put your mind to it. So our message to you all is to live life to the full, follow your dreams and come and stay with us! If you would like to add a donation to our cause click on this link Donate now. PS there will be one more blog of the out takes, funny stories and a slide show so stay tuned ! Congrats on a job well done!!!! Can't wait to catch up with you for a long over due cuppa!! Awesome Possums! Congrats! Sorry we missed you on this year's trip but hopefully we catch up next. Really lovely sharing on your blog, thank you! Dave & Amelia.